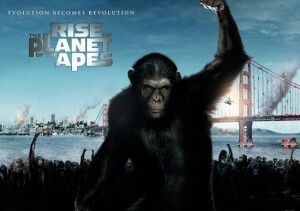 Rise of the Planet of the Apes sets out to explain how the apes rose to supremacy and destroyed mankind. The film is the prequel to the original 1968 film Planet of the Apes starring Charlton Heston, and the largely inferior 2001 remake starring Mark Wahlberg. Set in San Francisco, Wil (James Franco) is working as a genetic engineer and is attempting to find a cure for Alzheimer’s Disease to treat his aging father (John Lithgow), but is also experimenting with the intelligence of apes. But when Wil adopts and forms a special relationship with a baby ape named Caesar, he unwittingly contributes to the end of humanity. Year later Caesar is shipped to a ‘sanctuary’ where he is mis-treated, and subsequently uses his heightened intelligence to join forces with his fellow species to take over the world. The problem with this film is that there are no surprises, and audiences are bound to be left sitting there waiting for the inevitable conclusion. But while the narrative may be lacking and the dialogue is clichéd at times, the CGI is impressive and the film includes some notable action sequences set upon the Golden Gate Bridge. James Franco is charismatic as always, and John Lithgow plays his senile father with ease, but the beautiful Freida Pinto (from Slumdog Millionaire fame) is severely under-utilised as Wil’s love interest, Caroline. She has little-to-no lines and is clearly there to help mask the male dominating cast. If you’re looking for substance you won’t find it here, but Rise of the Planet of the Apes is an entertaining watch that will be best enjoyed on the big screen. 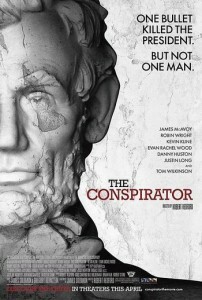 Academy Award winning actor Robert Redford directs The Conspirator - a period court-room drama set in the aftermath of the Civil War in Washington D.C. The film opens with the brutal assassination of President Abraham Lincoln and the attempted murder of the Vice President and the Secretary of State. It then follows the trial of the people who were arrested for conspiracy – seven men and a single woman, Mary Surrat (the owner of the boarding house in which the men planned their attacks). The young union soldier turned lawyer, Frederick Aiken (James McAvoy) is assigned to defend Mary Surrat, and after his initial reluctance, he begins to suspect that his client may be innocent. In the process, he learns that she is in fact being wrongfully used as ‘bait’ by the tribunal to capture her son John – the only conspirator that managed to escape. The film delves into the politics that arose around the Civil War, and the corruption of the government at the time. While the tone is fairly staid, McAvoy is convincing, and Kevin Kline portrays Senator Stanton with an evil charm. This is the first film made by The American Film Company whose aim is to produce factual films about America’s history, and overall, it provides an interesting an take on this significant historical incident. This entry was posted in Film and tagged assasination, film, history, james franco, Review, rise of the planet of the apes, the conspirator. Bookmark the permalink.